In my role as the Minority Leader of the Senate I travel the state and encounter many people; on special occasions I have been in the presence of a hero. Thursday was truly an exceptional day when Curtis Dagley, Gloucesterman and World War Two veteran, was decorated for his extraordinary accomplishments to save a precious 15th altarpiece of Krakow Poland’s Saint Mary’s Church. 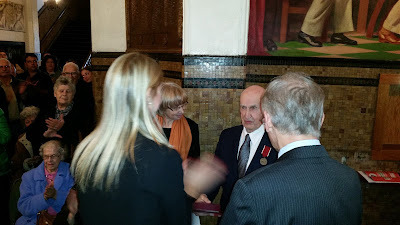 At a Gloucester City Hall ceremony Katarzyna Padlo, Consul General of the Republic of Poland presented Mr. Dagley with the Bene Merito Medal for helping recover the centuries old artwork from the Nazis. The object has more than 200 figures depicting the story of May in helping her son Jesus. Mr. Dagley’s service in Poland was tumultuous and included being imprisoned by communist authorities there. 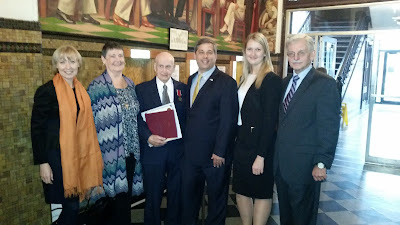 It was an honor to present him with a State Senate citation recognizing his wartime actions. Once his military career ended Mr. Dagley worked as a fisherman for more than four decades. We need heroes; we are blessed to have Curtis Dagley with us and he so richly deserved the special honors bestowed to him in the presence of his community and his family.